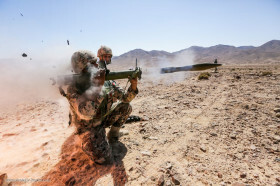 Jordanian soldiers fire a RPG-26 during a bilateral training. Australian Army M1A1 Abrams main battle tanks firing during Exercise Chong Ju 2018. The British main battle tank Challenger 2 during Saif Sareea 3 exercise in Oman. Challenger 2 main battle tank of the King's Royal Hussars firing live rounds during the British Army's Combined Arms Manoeuvre Demonstration. An M2A3 Bradley from Company D, 1st Battalion, 66th Armor Regiment, 3rd Armored Brigade Combat Team during crew night certifications. The Luftwaffe Tornado IDS ASSTA 3.0 multi-role combat aircraft during exercise « Two Oceans » in Bredasdorp, South Africa. A CH-53 Super Stallion, assigned to USMC Heavy Helicopter Squadron 464, carries a Humvee during an aerial refueling training operation. The Chinese PLZ-07 122mm self-propelled howitzer during a live firing exercise. Live-fire exercise of Ukrainian BTR-4 assigned to 1st Battalion, 92nd Mechanized Brigade. A live-fire combat team exercise for the Australian ASLAV during Gauntlet Strike exercise. Decontamination training of a Polish PT-91 Twardy MBT, during Operation « Reassurance » at Camp Adazi, Latvia. The Israeli Merkava Mk IV main battle tank firing. Australian Army live fire training from defensive position during Exercise Diamond Run 2017. J-10 Chinese fighter jets refueling from a HU-6 tanker aircraft. For the Military Dogs of the 102th Military Working Dogs Squadron, the experience of live firing reduces their tendency to be scared by the sounds of weapons firing. The Croatian M-84 main battle tank firing during a exercise. The Mogolian Armed Forces Honor Guard preforms during the opening ceremony of Exercise Khaan Quest 2017. 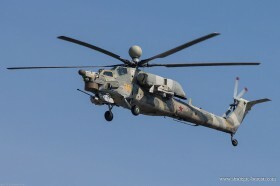 A Marine AH-1Z Viper attached to MAWTS-1 engage urbain targets. Firing drills during annual, multinational UNITAS 2017 exercise at Ancon, Peru. An AMX-10RCR from 1st régiment d'infanterie de marine firing during a live combat exercise.